I liked this book. There seems to be a lot of reviews that call the ending flat and incomplete with no connection back to the question asked at the beginning of the book. I beg to differ. 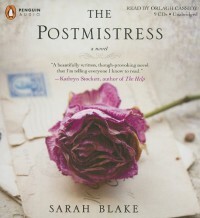 I think the title, The Postmistress, does not refer just to Iris, as Iris herself uses the American term, Postmaster. Rather, I think Frankie reckons herself as a Postmistress, the british term, who is inadvertenlty entrusted with a letter, in London, that she feels compelled to deliver, but does she? Thus, her question at the dinner party. There is a parallel drawn between these Frankie and Iris, with Emma being the pivot point between them. The men are secondary but required to push the story along. The writing was so wonderfully descriptive, perhaps a bit much at times, but only a couple of times. Frankie in particular, she starts off full of bravado and determination and is gradually chipped apart by all she experiences. It was quite riveting to me, to experience her journey. This was the best written part of the book in my opinion. I really felt the shell-shocked state (PTSD in current vernacular) that Frankie was in. I also felt Emma's denial and Iris's forthright honour (that certificate bit a the beginning was a bit unnecessary though). Suffice it to say that, to me anyway, the book is worth the time. Enjoy!